Large numbers of U.S. service members married while stationed overseas during World War II, though the War Department did its best to discourage unions between US service members serving abroad, ordering in January 1942 that “no military personnel in any foreign county or possessions may marry without approval of the Commanding Officer of the U.S. Army Forces stationed in such country of possession.” The couples also had to undergo physical examinations and inquiries by the Red Cross and/or the chaplain of the man’s unit. Once all paperwork had been submitted and approvals granted, there was still a two month “cooling off” waiting period. Once the marriage had taken place, there was still the hurdle of getting one’s spouse to the U.S. in the wartime. Notwithstanding existing Immigration laws, she would have to get special permission to enter the country on a non-quota basis, a process that could take six months or more. Then there was the problem of arranging transportation, especially difficult for UK brides as civilian transportation from England had halted. 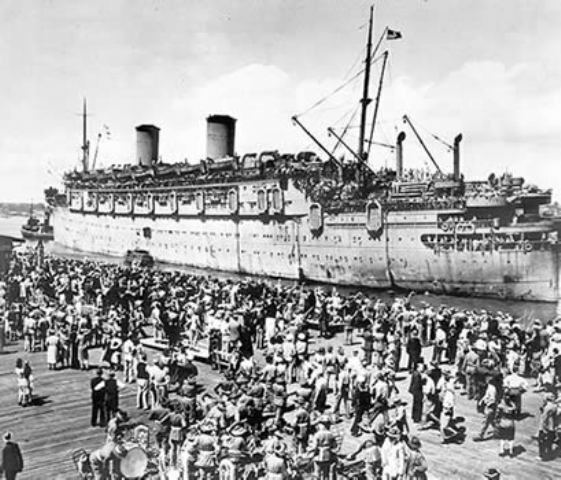 In 1944 and 1945, some brides and children from Australian and New Zealand were able to reach the West Coast, arriving on troop ships carrying Army and Navy casualties and soldiers and sailors on leave from the Pacific Theater. 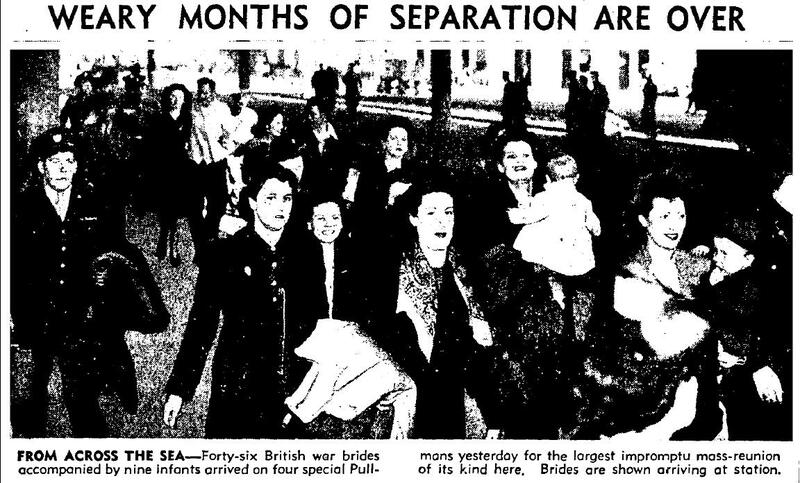 With the Allied victory, British war brides, who far and away represented the greatest number, could finally begin the process of being reunited with their husbands. First their non-quota status had to be approved by the Immigration and Naturalization Service. The “bride” (some of whom had been married some years by this point) then had to obtain a visa. Once cleared for transport, there was still the ordeal of the staging area at Tidworth in Southeast England, where she was subject to further vetting and medical examinations. The wait could be a long one, as the US military was still struggling to find transport for its own soon-to-be-discharged personnel. Frustration at the seeming lack of action reached a fever pitch in October, with some brides organizing a protest in London. One young woman, the wife of a US merchant marine, stowed away aboard his ship. Another stowaway war bride case came up on December 26, 1945. At that moment, the War Bride Act (aka Public law 271) was sitting on President Truman’s desk waiting to be signed, which he did on December 28, 1945. The Act exempted foreign-born wives and dependents of members of the U.S. Armed Forces from the quotas established by the Immigration Act of 1924. A fiancé and fiancée provision was added in June 1946. 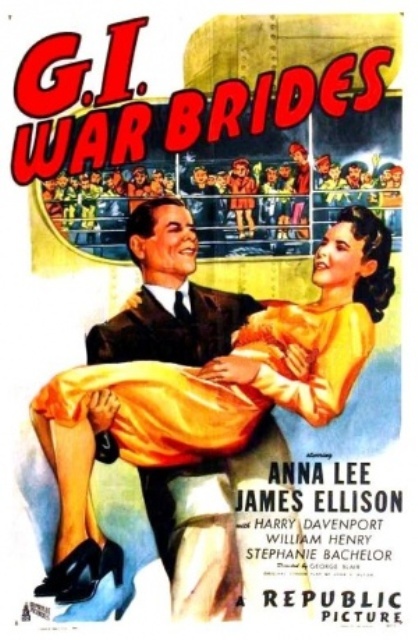 Operation War Bride got underway in earnest soon after the new year. On January 26, 1946, the S.S. Argentina set sail from England carrying 458 women and 175 children. The ship docked at New York on February 4, delayed a day due to stormy seas. 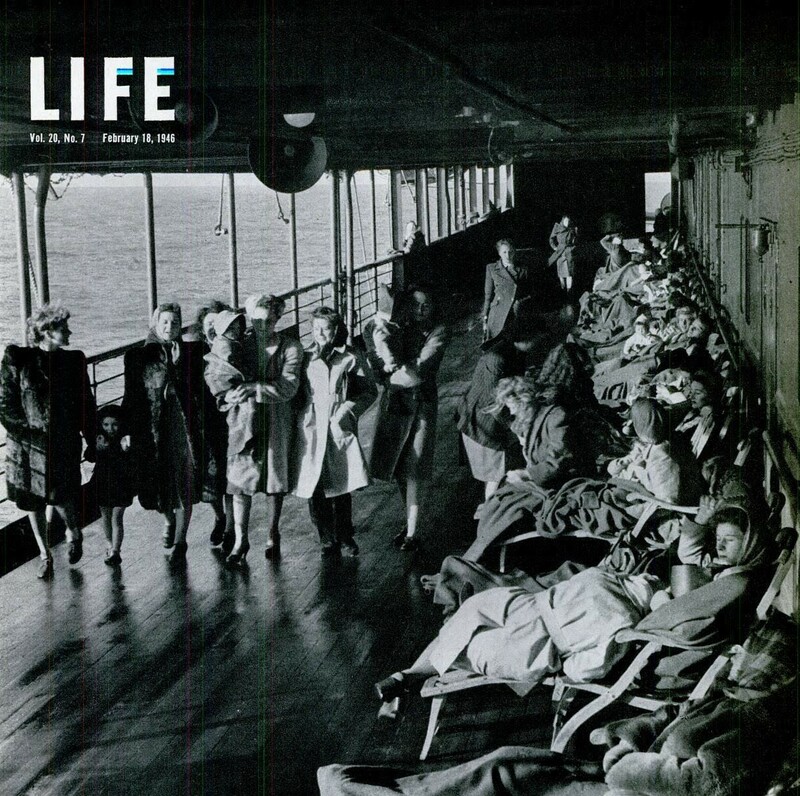 Life covered the S.S. Argentina war brides in its 2/18/46 issue. For 15 of the women aboard, the long journey wasn’t over. Their new homes were in California. The following day, they boarded a Southern Pacific “war bride special” train, bound for Los Angeles. 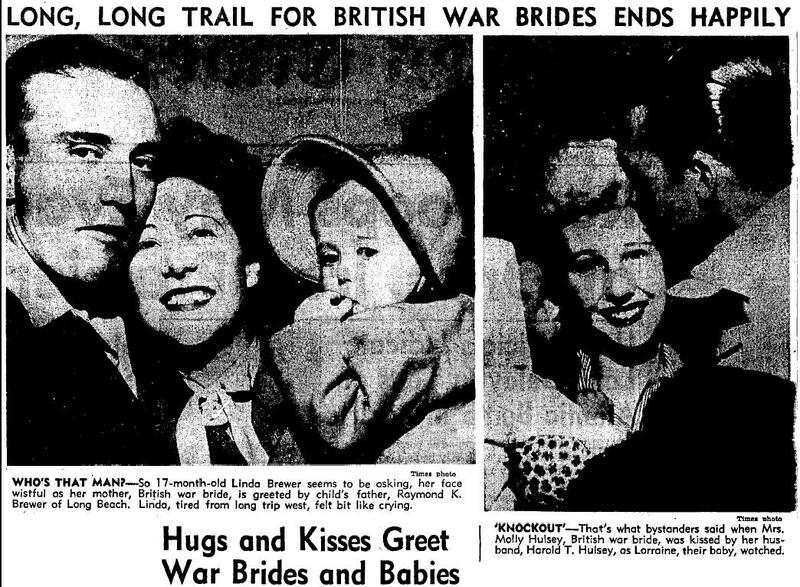 L.A. Times photo of the happy reunion between ex-US servicemen and the first 15 British war brides to reach Los Angeles after a 6000-mile land and sea journey. 2/8/46. On February 15, another group of 46 brides and babies arrived at Union Station, having arrived in New York on the Queen Mary five days earlier. The arrivals continued through the spring, bringing wives and babies from Britain, Australia, New Zealand, and a few from France and Belgium. The Los Angeles area had a festive air, with British war brides of World War I and other more recent ex-pats hosting fetes and teas for the newcomers. It was at one such party that a Paramount studio talent scout spotted newly arrived Welsh war bride Gwenda Davies, leading to her being signed for a film contract. But amidst all the gaiety there was tragedy- and heartbreak. Though the women hadn’t mentioned it- at least not publicly, lest they seem critical of their new homeland, they had endured horrible, squalid conditions aboard the transport ships. Even the Queen Mary Now, in May 1946 came reports of infants having been stricken during a crossing on the S.S. Zebulon Vance. Three had died en route to the US, and two more since, with many more hospitalized. The cause, yet unknown, was attributed informally to overcrowding and unsanitary conditions aboard the Vance. Two babies arrived ill on the S.S. Brazil from La Harve and were rushed to the hospital where one little girl, the 5-1/2 month old daughter of a Burbank man and his war bride, later died. Two more infants from the Vance died, as the Army transport George Goethls arrived from La Harve with 8 sick babies aboard. At the same time, the six-month-old son of a Los Angeles British war bride who arrived on the Queen Mary became ill and was rushed to the Children’s Hospital on Sunset Boulevard, where he too passed away. A Belgian war bride who had arrived on the George Goethals, was on a train bound for Los Angeles when her two-month-old son was stricken; he was taken off the train at Albuquerque and rushed to the hospital. On June 4, the mysterious malady took the infant son of a Long Beach man and his British war bride who’d arrived on the S.S. Holbrook. a few days later, another baby from the Goethals died in the east. The War Department investigating board’s so-called report, which addressed the Vance cases only, was a joke, blaming the mothers for their “lax sanitary conditions” and absolving the medical staff aboard of any blame. 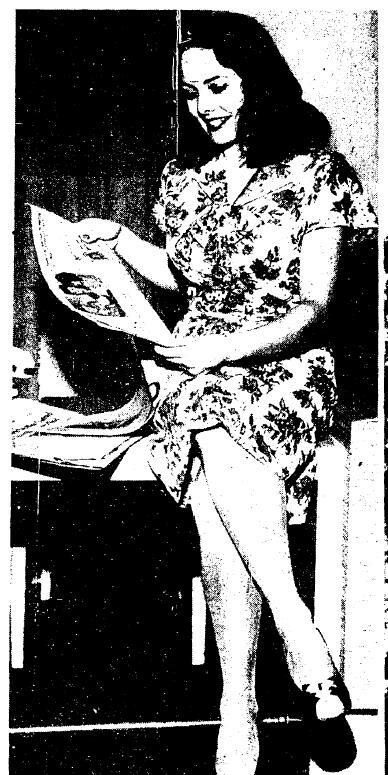 Then there was the case of Bridget Waters, war bride of Los Angeles resident Frank K. Waters. The two married in 1944 when Waters was stationed in England as a civilian technician assigned to the Army. Six months later he was ordered to France, and from there back to the U.S. where in early 1946 he relocated to Las Vegas, took a job as a bank clerk and filed for divorce. Bridget promptly arrived in the US- not by troopship but by airplane- with the couple’s 11-month old son, telling reporters in New York that she intended to seek $8000 in alleged damages from her estranged husband. “He can’t get rid of us that easily. He promised me $50 a month- and I’m going to get that too,” she added. In April, a Clark Co. judge awarded Mrs. Waters $100 a month temporary alimony pending outcome of the trial– an uncommonly high sum. In July the contested divorce went to trial and a jury ruled in her favor. The estranged coupled lived separately, with Waters allowed occasional visits with the baby. It was on one such visit, September 2, 1946, that Bridget shot Frank in the heart. The weapon was a snubnose .22, small enough to be concealed in the palm of her hand. The truth of what happened can’t be known. She told the police officer responding to the reports of gunshots “I told him not to touch my baby. Then he just kept going after my baby and that’s when I went after then gun and then I went after him.” During her trial in October, she testified that she’d only meant to scare Waters when the gun went off. The case attracted worldwide press attention, with flattering portrayals of the accused by a sympathetic press, which never failed to mention her “good looks.” The jury returned a verdict of involuntary manslaughter rather than murder. Sentenced to 1-5 years in Nevada State Prison at Carson City, she was paroled in May 1948 and returned with the child to Great Britain. Republic’s low-budget G.I. War Bride, about a woman who stows away on a ship from England to the USA, played as a second feature with film noir The Strange Love of Martha Ivers starting in August 1946. That the War Bride Law specifically applied to wives created a situation for at least one “war husband,” Roger Henri Charlier, a Belgian citizen who married an American Army nurse. After months of sticky red tape, the Army finally declared Charlier, an ex-Belgian Army major, resistance fighter and prisoner of war who had represented Belgium at the Nuremberg and Dachau War Crimes trials as a civilian employee of the U.S. military, a “war bride” under the law. He was transported to the states on a ship with other military spouses (all women) and babies. A non-fiction account of his experiences, written under the pen name Henri Rochard, appeared in the Baltimore Sun on September 28, 1947, and a condensed version in the November 1947 Reader’s Digest. Howard Hawks turned it into a screwball comedy, I Was A Male War Bride, in 1949. 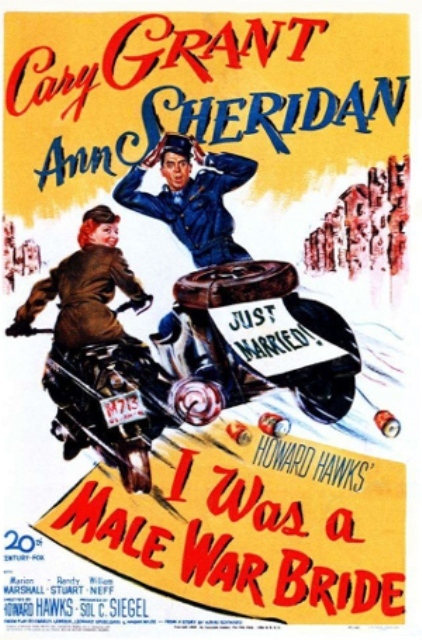 I Was A Male War Bride staring Cary Grant and Ann Sheridan had its Los Angeles release on August 19, 1949. It was based on the real-life experience of Roger H. Charlier, who was classed as a “war bride” but did not have to dress in drag as Cary Grant does in the movie.